Clyde came from behind for the second time in a week against opposition from a higher division though were able to hold on this time for a 2-1 win over Dumbarton. Goals from Darren Miller and Max Wright cancelled out Craig Barr’s first-half header in the Betfred Cup tie at Broadwood Stadium. Dumbarton named just four substitutes for their visit with Jim Chapman forced to make three changes to the side that let a first-half lead slip at Kilmarnock on Tuesday. Stephen Aitken’s men controlled the first half with Hearts loanee Alistair Roy missing several chances, including one he fired into the ground which bounced over the bar from a few yards out. On 33 minutes Clyde were behind after being caught sleeping. Chris Johnston collected a short corner before crossing to the back post for Barr to head in off crossbar. A half-time rollocking from Chapman proved the catalyst for a much-improved second-half performance. Miller appeared to shout towards his own dugout in frustration moments before channelling that anger to score a tremendous equaliser on 57 minutes. The midfielder likes to shoot at goal straight from corners and his inswinger was saved by goalkeeper Scott Gallacher. Miller then collected the clearance before curling an effort into the far top corner. Smart Osadolor was introduced for David Gormley and was involved in winning the corner that led to the winner ten minutes later. Again it was from Miller’s corner, which this time was knocked across goal by Martin McNiff and up popped Wright at the back post to nod home. A late rally from Dumbarton came to nothing but was notable for an exceptionally brave defensive header from Jack Breslin in the dying minutes, which ended with the centre-back clattering the post and leaving the field injured. 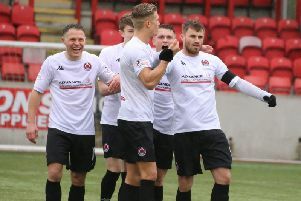 The win leaves Clyde on six points – joint-top of Group E with Kilmarnock and Ayr United – going into their final match at Somerset Park on Tuesday.